Today Chemistry Department of Multani Mal Modi College Patiala organized a seminar on Nanochemistry. Prinicipal Dr. Khushvinder Kumar formally welcomed the guest and cited the story of PC Ray, father of Pharmaceutical sciences and Pharmaceutical industry and inspired the student for carrying out socially relevant research work. Dr. Kumar asked students to be inquisitive and develop logistic and scientific temperament in their day to day activities. 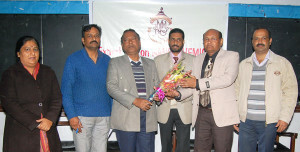 Dr. Vinay K. Jain, Head, PG Dept. of Chemistry introduced the speaker Dr. Bonamali Pal, Associate Professor, School of Chemistry and Biochemistry, Thapar university Patiala to the gathering. He emphasized on the importance of Nanochemistry in our daily life. Dr. Rajeev Sharma presented the vote of thanks. Prof. Ruhi conducted the stage well. Dr. Ashwani Sharma, Dr. Sanjay Kumar, Prof. Sanjeev Kumar, Dr. Anupama, Prof. Nitika, Darampal, Chitrangna, Ashwani, Shelly, Chitranshi, Jasneet were also present.